Lately it seems like everyone is asking that question. Although index funds are not new (the first index fund was created by Vanguard in 1976), they’ve become incredibly popular following the 2008 FInancial Crisis. Index funds now hold a third of the total assets of stock funds, up from less than 20% a decade ago. However, media outlets have recently been reporting on the comeback of the active fund manager… at least for now. According to research firm Morningstar, actively managed mutual funds are up 2.25% YTD, compared to passively managed funds which are up 2.2% and the S&P 500 which is up 1.9%. 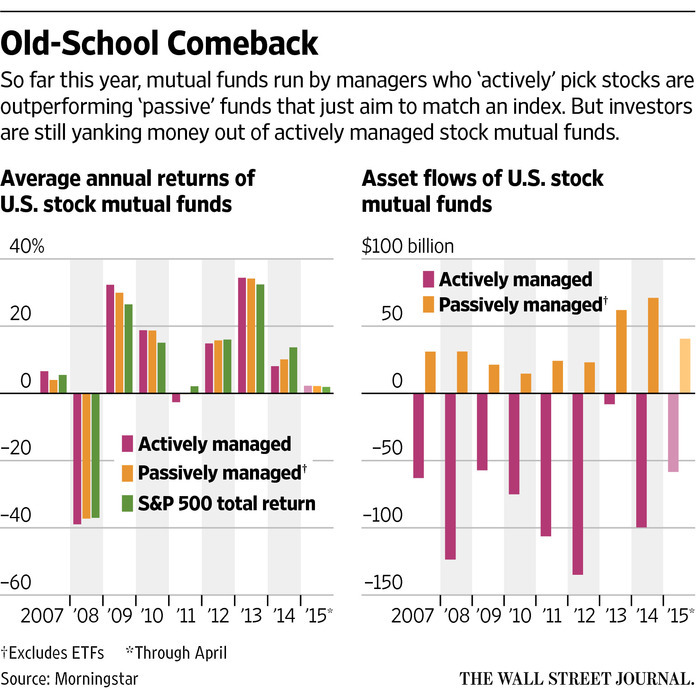 So what’s better: actively or passively managed funds? Over the long run, low-cost index funds (passively managed funds) are very likely to outgain actively managed funds. This is because any overperformance by the average active fund will not compensate for the higher fees charged by them. Note that I say the average active fund – the efficient market hypothesis is not actually valid, which means that a skilled active manager can still beat the market. This is why – as I explained in How To Start Investing Part I and Part II – index funds are great investment vehicles for Defensive Investors, while Enterprising Investors should be sure to conduct careful fundamental analysis and apply the principles set forth in Ben Graham’s The Intelligent Investor. Jason Zweig (who edited the revised edition of The Intelligent Investor and also has the same recommendations for Defensive and Enterprising Investors) attended a debate concerning index funds versus active funds, between John Bogle – founder of Vanguard Group and father of the retail index fund, and James Grant – editor of Grant’s Interest Rate Observer, a twice-a-month publication widely read by professional portfolio managers. Zweig scored the debate as a tie.